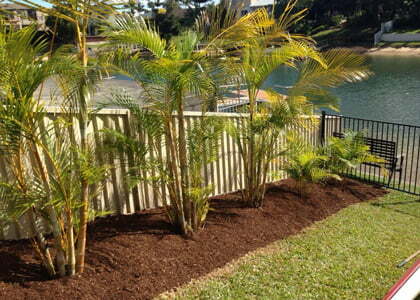 Add life to your home with a quality planting and mulching service on the Gold Coast. Choosing the right type of mulch and plant varieties can really complement your home’s design, adding significant value. Whether you’ve got a design in mind or want help from our experienced horticulturalists, our gardeners will ensure your backyard is looking colourful and vibrant! Want to learn more about planting on the Gold Coast? Picking the right plants isn’t all about what looks best. You need to find the perfect species for your specific soil type and the hot Gold Coast climate—as well as your style and budget. 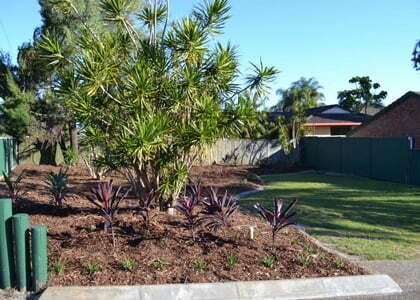 Our Gold Coast mulching and planting experts will help source the very best plants, trees and shrubs. Our gardeners will plant, fertilise and water them in. Just like plants, mulching isn’t just for looks. Our mulch will help your soil hold more moisture—which means less watering. It will also stop weeds from popping up and, over time, our organic mulch varieties will break down and increase your soil’s structure and fertility. 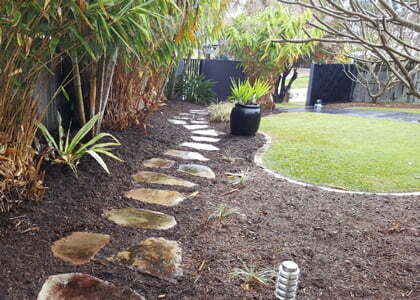 Focal Point Landscape Maintenance will help choose the best mulch for your garden. We can source tea tree mulch, bush mulch, shredded bark, wood chips, pine needle, gravel, river rock and more!